NASA leader Raila Odinga has said that he is unafraid of treason charges and will not relent in his fight for justice for all Kenyans. Speaking in Vihiga during Justus Etale’s funeral service, father of ODM communications director Philip Etale, Odinga noted that he has been detained before and survived the ordeal. “I don’t fear to be charged with treason because in 1982 I survived,” he said. The former Premier also noted that the Jubilee government was a scared lot after declaring NRM an organized criminal group. “We are yet to register National Resistance Movement, how do you ban something that doesn’t exist, they have panicked,” he said. 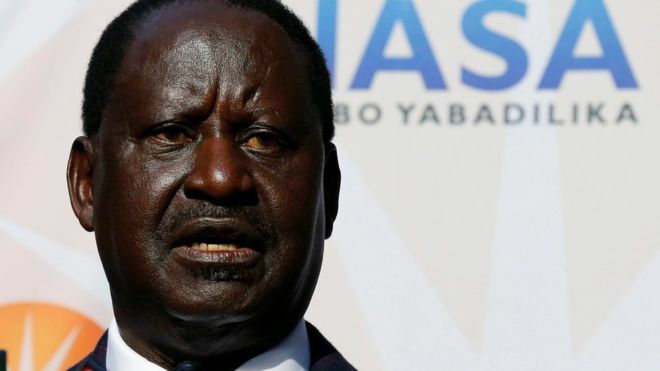 The ODM party leader also addressed the ‘illegal’ deportation of NRM general, Miguna Miguna saying that the government was wrong for not complying with court orders. He told the people that they (NASA) were working round the clock to bring back Miguna, who commissioned the People’s President ‘oath’ on January 30. The opposition has also threatened to call for mass action should Uhuru Kenyatta’s government not come to the negotiating table soon. “Everyone knows the country is in crisis. Everywhere we go, people are ready and willing to take up arms and fight for what they think is right,” Raila told the Standard. “Uhuru and Ruto are driving the country down the road of destruction, they only seem to listen to themselves. That is why we are considering the demonstrations to let them know that Kenyans are not happy,” Kalonzo Musyoka noted.